The bees and flowers have a complicated and beneficial symbiotic relationship. In a symbiotic relationship between bees and flowers, both parties benefit from that relationship. And not only bees and flowers, everyone benefits from their relationship. The bees need flowers for food and flowers depend on bees as pollinators. They help each other to survive and reproduce. There are some solitary bee species, such as carpenter bee, but most bees live in large colonies. These colonies consist of a queen bee, female workers, and male drones. The queen has only one duty, and that is to lay eggs. She lays thousands of eggs, which means there are a lot of offspring to feed. For them, the relationship between bees and flowers is of particular importance. The only food they eat is pollen, which is along with honey the only source of food for bees. Flowers attract bees with bright colors and nice smells. Attracted bees land on flowers and collect pollen. The pollen is picked up when the hair on bees’ bodies rubs the male antlers of the flowers and is gathered into pollen sacks on bees’ legs.Did you know that Flowers’ Aroma can calm the most aggressive of bees? Bees also benefit from collected nectar which is a mixture of plant sugars and water. Nectar is a great source of energy for bees allowing them to do their hard work. 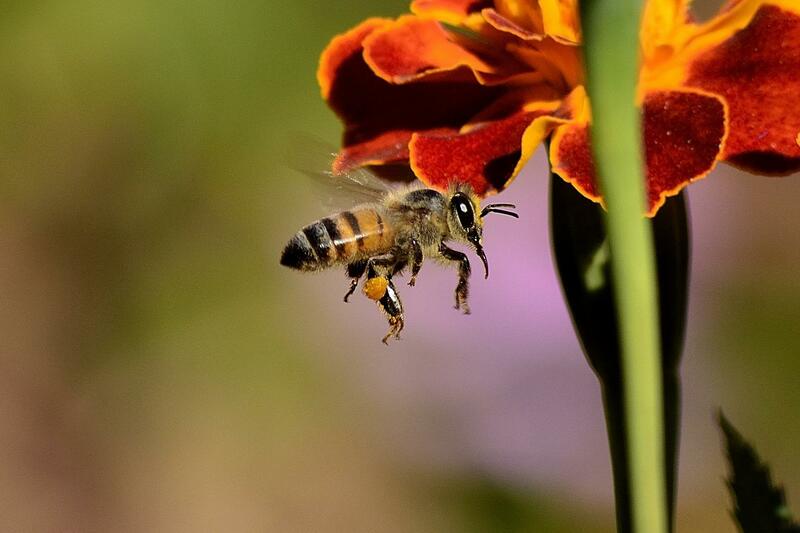 Bees travel from flower to flower collecting pollen and nectar. As they travel and gather pollen, some of it falls from their body onto female flowers. If the flowers are the same species then cross-pollination happens. The result of cross-pollination is the fertilization of the female plant. We have all learned in biology that the fertilization is required for the production of seeds. Seeds keep the plant species alive, and the survival of certain plants is dependant on pollination by bees. Though humans are not directly a part of the symbiotic relationship between bees and flowers, we still greatly benefit from it. At least two-thirds of plants people eat are very dependant on pollination by bees. If bees suffer a drop in numbers, it will also impact many plant species. The future of humankind depends on this relationship between bees and flowers. Read More: How dangerous are killer bees? What to do if you encounter them?